It’s the end of a hard day. Your muscles are aching for a relaxing shower. You turn the tap on and wait for that stream of hot water and … nothing. No. Hot. Water. What’s wrong? We’re taking a look at the most common reasons your water isn’t heating. It makes sense to check this first since it’s the easiest problem to fix. Make sure the pilot light is on. If not, you should follow the manufacturer’s instructions for how to relight it. Fuel supply in gas heaters. When you’re not getting hot water, you might automatically suspect an unlit burner. There could be something amiss with the gas supply. Gas has to be turned on at the gas meter and, as common sense as it sounds, you must make sure the knob on the heater is in the “on” position. 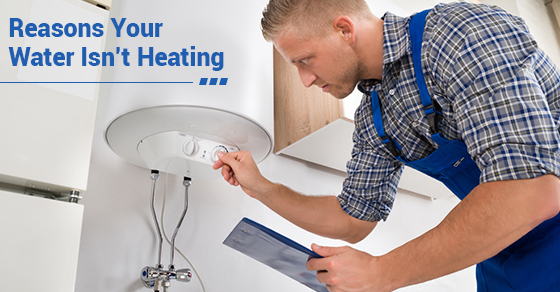 If you have a gas hot water heater, the problem may be a leak in the gas line to the heater. If there’s a rotten egg smell around the heater, this could be your culprit. This dangerous problem should only be handled by plumbers. The reason you’re not getting hot water could be due to the unit’s heating element, which may need replacing. Sediment buildup may be a problem. Hot water heaters should be cleaned often. Hard water can be softened with a water softener. Try reducing the water temperature in the heater to 130 degrees F.
A rusty hot water heater will need replacing. If the hot water seems to just be trickling, you’ll need to adjust the heater thermostat. If you find they aren’t working right, they’ll need to be replaced. Dip tubes in water heaters convert cold water at the top of heaters to the bottom of the tanks where water is heated. When there’s a crack in the dip tube, cold water moves out of the heater outlet pipe without being heated at the bottom of the tank. It doesn’t pay to fix dip tubes on old water heaters. Time for a new heater. If you can’t figure out why your water isn’t heating properly, contact Brothers Plumbing to talk to one of our experts today!